If you wonder if implementing a Print MIS (management information system) will be worth the time and expense, try calculating the ROI (return on investment). Even if your print business is relatively small, the Print MIS ROI can be impressive — particularly if you choose an easy-to-use, cloud-based program. A Print MIS (management information system) is integrated software that automates everyday administrative tasks such as providing estimates, entering and shipping orders, submitting purchase orders, and getting proofs approved. A Print MIS centralizes data about customers, suppliers, orders, job status, schedules, and production costs so it can be accessed by multiple people. A good Print MIS system will minimize miscommunication and duplication of effort and enable you to make smarter decisions about your business. ROI is a formula for determining to what degree the potential savings that will be gained from the software will exceed the costs of implementing it. 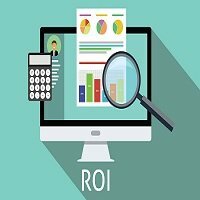 To calculate ROI: (1) subtract the costs of implementing the software from the potential cost benefits can be achieved; (2) Divide that figure by the cost of the investment. For example, if you could achieve $50,000 in labor cost savings per year on a system that cost $30,000 to implement, you would divide $20,000 by $30,000.Your ROI would be 66.6%. But calculating ROI can be tricky. You may underestimate (or overestimate) some of the potential financial benefits. Or, you might overlook some implementation costs. Here are a few savings and costs to take into account when determining Print MIS ROI. Figure out how much time your staff spends creating estimates each month. How much time do you or your employees spend preparing an estimate for a typical job? What is the average hourly wage of the employees who create estimates? How many estimates do your employees create during a typical month? Calculate the administrative costs at other points in production workflow. Whether employees work in prepress, production, finishing, or shipping, they probably spend a certain amount of time on non-production-related tasks such as re-entering data, record-keeping, answering phone calls, or requesting supplies. Multiply the number of hours employees spend on these tasks per month by the average hourly wage of the employees. Evaluate how your customer-service representatives spend their time. How many hours each day do your employees spend answering customer questions about the status of their job or chasing down proof approvals? Some studies have shown that customer-service reps spend 20 to 30 percent of their time rounding up information requested by sales reps and customers. Estimate how much time you will be able to save by implementing each of the modules in a Print MIS program. For example, if a Print MIS program will enable you to create an estimate in 10 minutes instead of 2 hours, you will be saving 110 minutes (1.83 hours) per estimate. Multiply 1.83 hours by the employee’s hourly wage (e.g. $35) and you will see that you could save $64 of the cost to create just one estimate. Multiply that number by the average number of estimates you produce and you will see that the savings can be substantial. The cost of a Print MIS program depends partly on whether you are purchasing a program for on-premise use or subscribing to a cloud-based system such as Ordant. For an on-premise system, you may need to buy additional servers or computers and pay fees for maintenance or upgrades. With a cloud-based program, your ongoing monthly subscription fee includes hosting, technical support, and all upgrades. The cost of implementing a Print MIS depends on how organized your administrative systems already are. For example, consider how much time it will take to gather all of the cost data you need to produce accurate estimates. Other costs to consider include employee training time and expenses and fees for customizing the software to handle processes or services that are unique to your shop. Plus, employees will need to spend some time each month keeping the data in the system up to date. Some potential benefits of Print MIS will be difficult to quantify financially. For example, when you reduce the amount of time employees each day on administrative tasks, they can focus on assignments that can help grow your business. Some employees could be trained for marketing and sales-related tasks. Production employees could acquire new technical skills or create new types of products you could promote and sell. Over time, a Print MIS will give you data that can help you make smarter business decisions. For example, you will be able to see how many estimates are converted into orders and if every job your produce is profitable. You will also know which types of jobs and customers are more profitable than others. At Ordant, we help all types and sizes of printing companies get a Print MIS system up and running quickly and cost-effectively. If you schedule a demonstration of Ordant software at www.ordant.com, we could share more specific ideas about how to calculate Print MIS ROI for your shop.